This beautiful two story brick home located on Eagle Drive in Wytheville, Va. has plenty of room for the entire family plus guests. With 5 bedrooms and 3 full baths you will not run out of space. 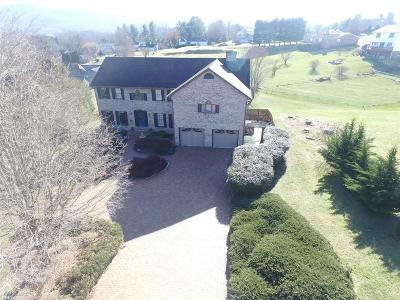 Located in the Country Club subdivision with amazing views of the mountains and the pond on the Wytheville golf course. Loaded with updates which include a newer kitchen, roof and newer heat pump. The main floor offers a spacious kitchen with a breakfast nook that opens to a large family room. Living room, formal dining, bedroom(office) and laundry room are also on the main level. Upstairs, which can be accessed from either side of the home, features a master which is separated from the other bedrooms and has its own large bath consisting of double sinks, bath tub, walk-in closet and a private room for the toilet and shower. A huge Recreation Room (or 6th bedroom) is great for relaxing and entertaining. There are three other bedrooms with walk in closets. Directions: I-81 N Or S Exit 73, Continue Through Town. Turn Right On Old Stage Road. Right On Arrow Lane. Right On Eagle Drive. House On Right.